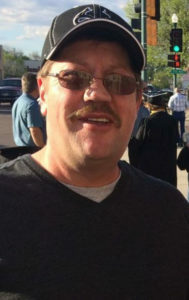 Randy Sund, 46, of Yankton, SD passed away on Thursday, Sept. 27, 2018 at the Avera Sacred Heart Hospital in Yankton, SD. Funeral service were held on Tuesday, Oct.2, 2018 at 10:30 a.m. at the First Christian Church in Winner. Burial followed in the Winner City Cemetery. Randy was born on Feb. 19, 1972 in Winner, SD to Linda Sund. Randy grew up and lived in Winner. He graduated Winner High School in 1990. Shortly after graduation he moved to Yankton, SD where he was currently employed at Wilson Trailer. He always had stories to tell about the “guys” at work. Randy enjoyed hunting and did a little fishing as well. Randy never hesitated helping out his family and friends with whatever they needed, no matter what it was. He would often drive up to the “Sunderosa” for brother time. Randy always enjoyed coming home for family gatherings, holidays and special events. Randy is survived by his mother Linda Sund; his brother Terry(Amy) Sund; sister Tammy Sund; brother Steve(Laurel) Sund; sister Teresa(Justin) Lenning, nephews Alex Till, Riley Sund and Jared DeWitt and niece Kayslynn Lenning. He is preceded in death by is grandparents Eldon and Ruth Sund; uncles Pat Sund, Kenny Parvin, Cliff Hight and Loren Tarrell. Randy will be greatly missed by all of his family and friends.